KITCHENER - An attempt to keep a persistent raccoon out of a Tara Crescent attic has resulted in $100,000 worth of damage. Fire officials say the homeowner had placed a halogen light and a radio in the attic to deter raccoons from entering through the eves. 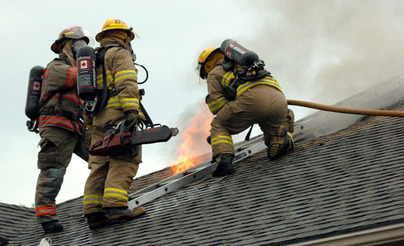 It's believed the heat given off by the light is what sparked the blaze, which burned through the attic Wednesday night. Firefighters were called to the fire just before 7:30 p.m. after a neighbour saw smoke coming from the home, said Kitchener Fire Platoon Chief, Kevin Karley. When crews arrived, they found a fire burning in the home's attic and spotted a raccoon scurrying across the front lawn. Firefighters contained the flames to the attic area, but the home suffered smoke and fire damage. The residents of the home made it out unharmed. The fire is still under investigation, but the cause is believed to be the halogen light, Karley said. About six hours later, firefighters were called to an apartment on Bruce Street near Frederick after a pot on the stove ignited a bathrobe hanging nearby. Karley said a door to the apartment's bathroom was left open close to the heating element and a robe hanging on the door caught fire. The damage was minor and the tenant was not injured.